Nothing puts the thrill of victory and the agony of defeat on display quite like letting a bunch of 12-year-old kids play baseball on national television. Every year, the best Little League teams from around the world converge on Williamsport, Penn., for the Little League World Series. While most of the players you see will eventually find themselves in more typical careers, some will continue to play baseball under the bright lights all the way to the Major Leagues. Fifty-four players have done so before, following a path from the LLWS to MLB. Here are some names that you probably recognize, followed by a complete list of every Major Leaguer to have played in the LLWS. Before he was the 2017 NL Rookie of the Year and an All-Star, Bellinger was an 11-year-old fan of Manny Ramirez in the 2007 LLWS. His Chandler, Ariz., team lost to Georgia in the U.S. final. In one game against Maryland, Bellinger went 3-for-3 with a home run and two singles up the middle. After homering in the Little League World Series, it may come as little surprise that Bellinger did the same thing in the 2017 World Series for the Dodgers. The Todd Father! Though Frazier helped the Yankees to the 2017 ALCS and signed with the Mets the following offseason, he's been a hometown hero in the area much longer. Twenty years ago, Frazier was homering in Williamsport to cement his status as an actual hometown hero in Toms River, N.J. Frazier and Toms River won the Little League World Series that year, and the team later traveled to Yankee Stadium, where Frazier got to stand on the field next to his idol: Yankees captain Derek Jeter. Before he belted 509 home runs over 20 MLB seasons and helped the 1997 Marlins win the World Series, Sheffield was helping his team from Belmont Heights, Fla., reach paydirt in Williamsport. Back then, Sheffield was a pitcher who was worried about facing the team from Chinese Taipei in the championship. Turns out his fear was validated when Chinese Taipei beat Belmont, 4-3, in the 1980 championship game. You can hear him talk about his experience in the video up top. Sheffield and his son -- Gary Sheffield Jr. -- are visiting Williamsport for this year's tournament as the father looks to inspire his son to seriously consider chasing a career in MLB. Varitek will never buy another drink in Boston thanks to his helping hand in vanquishing the Curse of the Bambino with the 2004 Red Sox. Before that, though, he played shortstop, first base and catcher for the Altamonte Springs, Fla., Little League team that reached the 1984 championship game. 'Tek went 1-for-7 in the tournament but drew three walks. Conforto's team from Redmond North, Wash., was eliminated in three games, but the current Mets outfielder held his own, going 6-for-10 in the tournament. After starring at Oregon State, the Mets drafted him 10th overall in the 2014 Draft. He translated that LLWS experience to success with the Mets in the 2015 World Series, where he went 5-for-15 with two home runs. Grichuk appeared in back-to-back Little League World Series, leading Lamar Little League to Southwest region titles in 2003 and '04 as a pitcher and first baseman. After a 4-for-9 showing in '03, Grichuk put on a clinic in the '04 LLWS, leading all players in hits, home runs, slugging and RBIs. 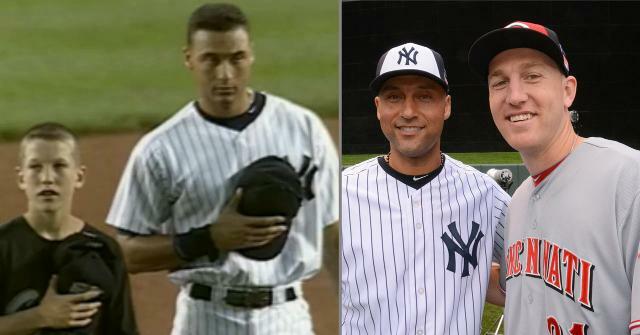 Over a decade later, he's still hitting home runs. Only now he's doing it for the Blue Jays in Major League ballparks. Speaking of the 2004 LLWS, Brewers infielder Schoop played a huge role in bringing that year's championship to Curaçao (along with teammate Jurickson Profar). Schoop logged multiple hits and RBIs in International play, and later went 2-for-3 with an RBI in the title game against California. He also recorded the final two outs and earned a save for his troubles. "It was the best experience of my life," Schoop said. "We were a small country and no one knew us. We went there and played really good ball and won it all. At 11 and 12 years old, going to the States, it was exciting to win it all. The best ever. It was some real exciting stuff." Before Boog Powell played in four World Series and won the 1970 AL MVP as an outfielder for the Orioles, he was a power pitcher for the 1954 Little League World Series team from Lakeland, Fla. This was before there were limits on how frequently a kid could pitch, so Powell threw in 11 games leading up to that tournament. His team was eliminated by the squad from Schenectady, N.Y. The funny part about that is that Major Leaguer Jim Barbieri was on that Schenectady team and later appeared as a pinch-hitter for the Dodgers in the 1966 World Series ... against Powell's O's. Profar joined Schoop on Curacao's '04 LLWS Championship squad as a pitcher. He struck out 19 in 12 1/3 innings on the mound and was 5-for-16. He returned to Williamsport the following year, where his team lost in the International title game, and turned in an even more impressive performance. He recorded hits in seven of his 18 at bats and struck out 26 in 13 innings pitched with a 1.85 ERA. After making his debut for the Rangers in 2012, Profar is enjoying a breakout season in 2018. Though he's finally realizing the talent that made him the top prospect in the game in 2013, he has yet to pitch in a Major League game. Lynn gave up a grand slam in the '99 Little League World Series and says that, if he could give any advice to his 12-year-old self, it would be to throw a different pitch. As a member of the 2011 Cardinals, Lynn became one of 12 players to play in the Little League World Series and the actual World Series. When he appeared in the '13 Fall Classic, he became one of only five players to play in the LLWS and multiple World Series.